When used as a suffix—that is, -apsis—the term can refer to the two distances from the primary body to the orbiting body when the latter is located: 1) at the periapsis point, or 2) at the apoapsis point (compare both graphics, second figure). 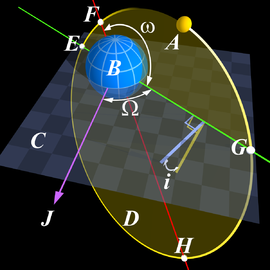 The line of apsides denotes the distance of the line that joins the nearest and farthest points across an orbit. (see third figure).